GuitarControl.com released a new video guitar lesson from GuitarControl.com instructor and creator Claude Johnson. 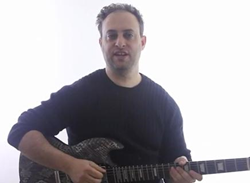 In this guitar lesson, now available on YouTube.com, Claude Johnson teaches a lick using arpeggios. “Today I want to show you an easy lick using arpeggios”, says Johnson. Claude demonstrates this easy guitar lick in the key of B as follows; 9th fret of the 4th string with 2nd finger to the 7th fret of the 3rd string with first finger to the 9th fret with 4th finger. Claude plays this sequence twice as triplets for beats one and two and then repeats the first two notes as ¼ notes for beats three and four and ending finally on the first note. “That’s a lick that I came up with just now for you guys”, says Johnson, “if you want to learn more about arpeggios check out my course Killer Guitar Control Secrets”. Guitar TAB’s are available for this easy beginner lead guitar lesson at GuitarControl.com.